Are you looking for corded curtain tracks in Perth? Do you have a custom installation requirement or boutique design idea? Perhaps you’ve been hunting for tracks in Bunnings, Ikea or even Big W, but you realise nothing is flexible enough to do the job you need. If that sounds like you, then look no further than Uni-Q Curtain Tracking System. Talk to us about our fully-integrated tracking system, with parts that can be mixed and matched to give you the best corded curtain tracks for your property. 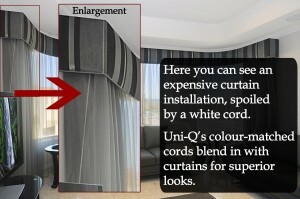 No job is too big or too small and we can completely customise almost any curtain installation you can imagine. Yes, it’s true! At Uni-Q, we offer curtain cords in a variety of colours to better blend in with your curtains. No more unsightly white cords showing through your black sheers! Corded or Uncorded Curtain Tracks? As we have noted elsewhere on our site, curtain cords have been associated with safety risks. As a result, there are safety standards imposed in Australia. Rest assured our corded curtain tracks meet these standards. What’s more, we can also supply our tracks completely uncorded… which means you eliminate the risk altogether. Click here to send us your enquiry – or talk to one of our friendly Perth team today about your corded curtain installation options and colour choices!